I chose the temple of Isis first. The first floor had a shard stuck behind a switch, making it impossible to get. The dial for the attack system seemed to go 1/8 of a rotation after I pressed the button each time. When I went to the second floor, I tried opening the menu to check something. The game then crashed. I gave it a play and I was kind of disappointed with the balance. It seemed like the monsters scaled with the player, which is fine but they were very powerful. Maybe it was the character I ended up getting from the initial choice sequence (which was very cool by the way) but my guy seemed to have very little defense and negligible attack stats, even after purchasing the best possible gear. Also, the encounter rate was WAY too high. For a puzzle based dungeon, I really don't like taking two steps and encountering a monster. I will say, the attention to detail with the Egyptian mythos was spot on, and the mapping and art were both excellent. Sound fit well and helped with the atmosphere. 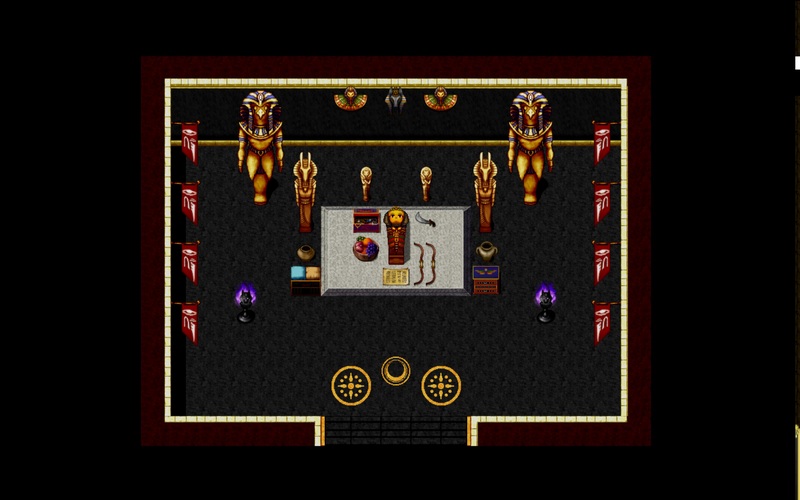 Most of the puzzles in the dungeon were fine, although I encountered one in The Temple of Isis that was basically just guessing which switches to pull and while a trial and error method wouldn't be a problem in itself, the aforementioned encounter rate really made that floor of the Isis dungeon feel like a chore. My suggestion is to alter the encounter rate and work on balancing the fights a little bit more. Also, perhaps after each dungeon is cleared, perhaps offer a story moment, even if it is small so the game doesn't feel just like a crawler. 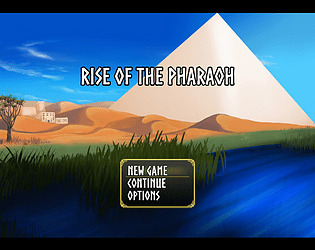 Storyline: The Pharoah is dead and lawlessness as spread over the realm. The gods have each chosen a champion to represent them and become the new ruler. Depending on which god you choose, will affect your stats. I guess, I'm not really sure. The story is simple and gives you a goal to complete. Fun. Controls: From what little I saw, the battle system was above average. You need to time your attacks just right on a dial. As long as your at least stopping it, you'll be hitting the target. However, those kinds of timing systems are best used for Skills and Special attacks. For the main attack feature, it's just best to leave it as is. This is an ATB battle system, so the monsters will wail away on you while you figure out which skill to use. And with no real way to heal, it won't be long before you're calling it quits. That aside, you will be visiting each deity's temple and they all have the requirement of finishing exploring it before leaving. But the dungeons are random and there are many puzzles that you only have one try at solving. Add the random encounters and you may see the problem. 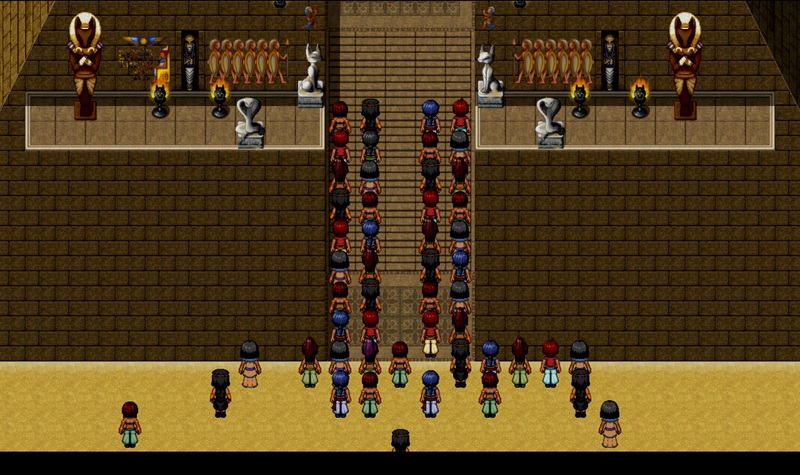 Presentation: Tall sprites are used and the Egyptian theme implemented. It looks pretty nice and polished. The town you start in is certainly active and the pathways are clear and accessible. There is no world map, but the overall selection screen of the temples makes it look as though you're traveling to each. Your character is a nameless, red haired, girl, who is known as "Champion". In truth, I think this is a detriment, as you should be able to choose a gender, along with an appearance and a name. Oh course, who knows, maybe the earlier choices actually does that. Fun Factor: I truthfully did not play this game too long. Once I got to the dungeons, I was faced with many dead ends, with no hope of healing and a constant stream of enemies. The game has potential, so I'm not going to write this one off completely. Reviewed for Secret Santa 2018. 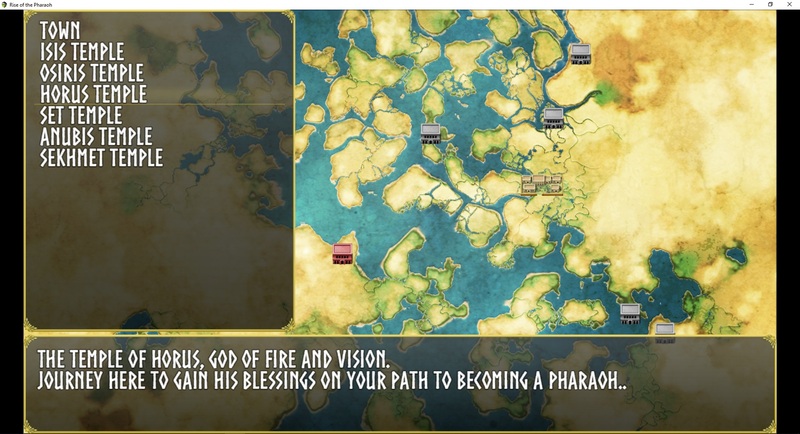 You are Kylus, a champion of your chosen deity that is aiming to become a new pharaoh after the old one died. 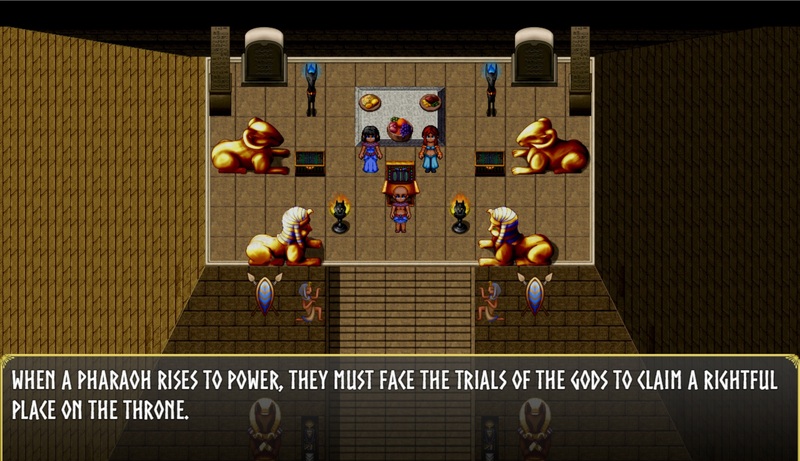 You are required to pass trials of the six Egyptian gods before you are supposed to tackle the Tomb of the Pharaoh. 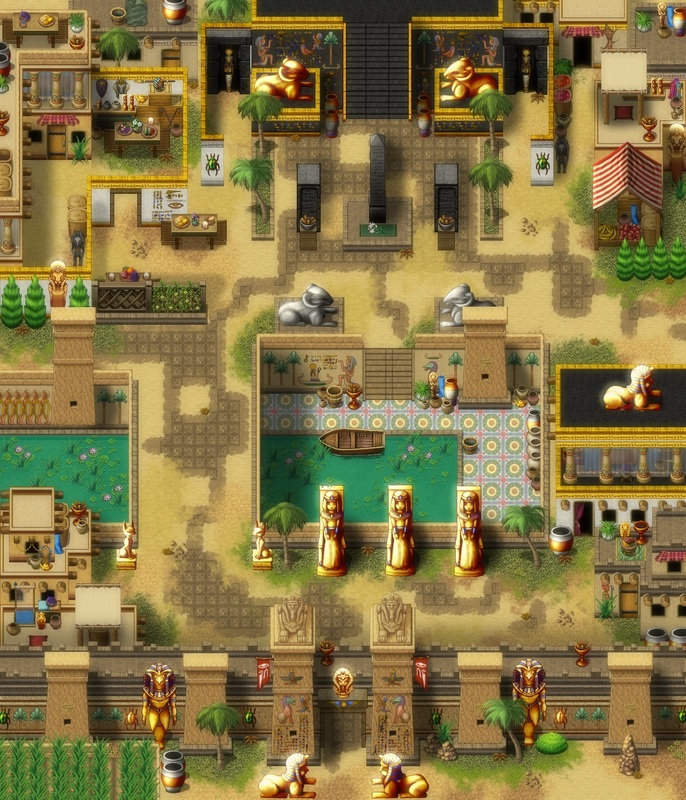 I chose Anubis as my Deity and started my gameplay at his temple. The dungeons are randomly generated. I found a bug in one room where you could jump off the floor into the walls, but nothing major came out of it. I couldn't use the trick to take a shortcut or anything, and I could safely jump back into the floor to continue my exploration. There are puzzles in dungeons. In Anubis' dungeon I was tested of my knowledge of Egyptian gods, which I barely have, so I did not find that exactly enjoyable. Failure to answer the question resulted in a battle. I also played Isis' dungeon, in which the puzzles were more classical 'push switch to progress'. 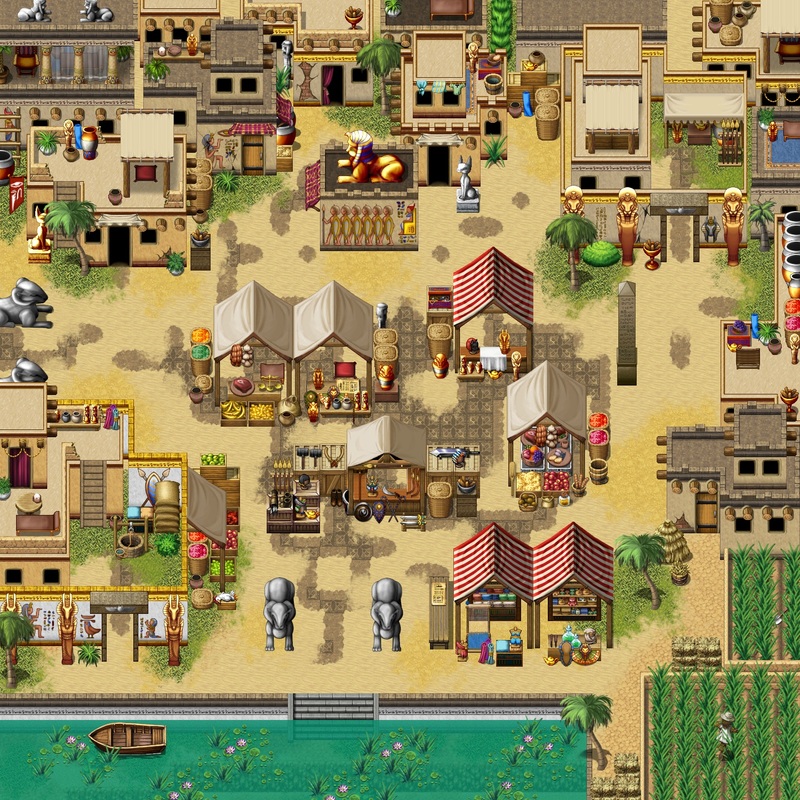 -You should give the player an option to have the enemies wait while you choose a command. Sometimes I was wondering on which spell to cast while the enemies pounded away whittling my HP. -The attack "minigame", while an interesting gimmick at first, becomes rather tedious after a while. And while I understand this is just a demo, hitting the marked area resulting in a miss isn't really fun. You should probably try to make these into certain hits, if possible. Speaking of combat, I found the encounter rate a little high. I ultimately had to stop in the middle of Isis' temple because both my HP and MP were too low to continue. I played around an hour and a half, so I think I caught a good impression on what to expect. The game featured pretty, vividly coloured graphics, which didn't deter from the experience. The battle backgrounds felt a bit empty. The music was alright, nothing too memorable, but not at a level where I'd turn the music off. There were two things concerning plugins I'd like you to address: because I play on a 144Hz gaming monitor, having Synch Monitor FPS turned off by default resulted in sped-up gameplay. I suggest you turn that on when you finish the game. Also, I think having Print Screen save screenshots into MapShots folder isn't exactly expected behaviour, and I suggest you turn Hudell's plugin (I think you're using that) off when deploying. Neither of these is a major issue, though.